the reason i go along with my flatmate is that she, too, has a sensitivity towards the "presence" of things. stones, shells, things. putting them intuitionally at points in the house. makes a difference. somehow. this is also the reason i love to converse with ella. she, too, has this kind of sensitivity. and she can even make things move. u go into the bathroom and the music starts to fill the air! this is a ritual of moving into my new room in Vienna. there was a strange smell in the room. this mysterious smell would come back as soon as i would close the windows. 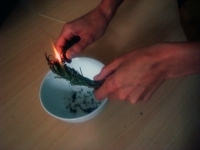 so when i shared this issue with my faltmate DAni, she came with the idea of burning sage. and so we did. sage is "adaçay?" in TUrkish. Also the best cure if one catches a bloody cold. a powerful herb for biological & emotional health / well being. 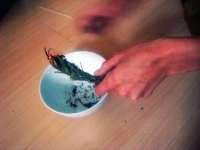 It has been used for ages for purposes of healing & cleansing, taking on an iconic meaning. 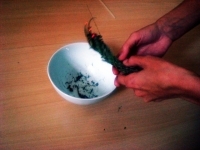 Burning sage, letting its smoke travel in the air (generally at home): this is a cleansing ritual to establish "positive energy"," clear thinking", "harmony of thought" and "healing". it smells good, to say the least.